I got busted yesterday. Missouri Department of Transportation told me I couldn't block a line of traffic with out a permit. With fruitcakes driving past me at 50 mile perhour 1.5 feet away I closed a lane of traffic. So I put up a 4x6 piece of 1" think plywood screwed it to the pole and put a stake on the other end and screwed it to that and restored the lane to it's full 40 mph zone. I love our State folks. "The law says". Yet that law wasn't in place when they made a single lane road 4 lanes and didn't pay to have the utilities moved. Now a days it cost them thousands of dollars to have the utilities moved out of their way...but for old grandfathered stuff. Come on folks get a grip. We had 3 pieces of debris come flying down into our work area... can you amagine that hitting your car at 50 mph. Forutunately we had most of the wreck out work done by the time "the letter of the law showed up" . I often wonder what people are thinking...or not thinking. I see police and state troopers blocking a lane of traffic causing 4 miles of stopped traffic for a fender bender. I don't get that at all. Clean it up and get the problem out of the way. When my son had his blow out. The support services caused more problems than they fixed with the traffic they blocked and all the rubber necking caused a head on wreck in the next road over. Working on the streets has me ranting today. Sorry! GRN! I guess it's a hassle to get a road block permit? Seems like your office should be on top of stuff like that, unless the repairs are such that they can't know in advance where you'll have to be? New addition to my office. 1941 Royal Companion typewriter. Definitely a whole different world from the PC keyboard! You can't delete when you screw up and the keys are a whole lot harder to push unless you want the letter to be very light. It's fun to play with something genuine vs everything being electronic. That's pretty close to the model I used in HS typing class. Got up to 50 wpm. But Phillip is an Electronical Genious. 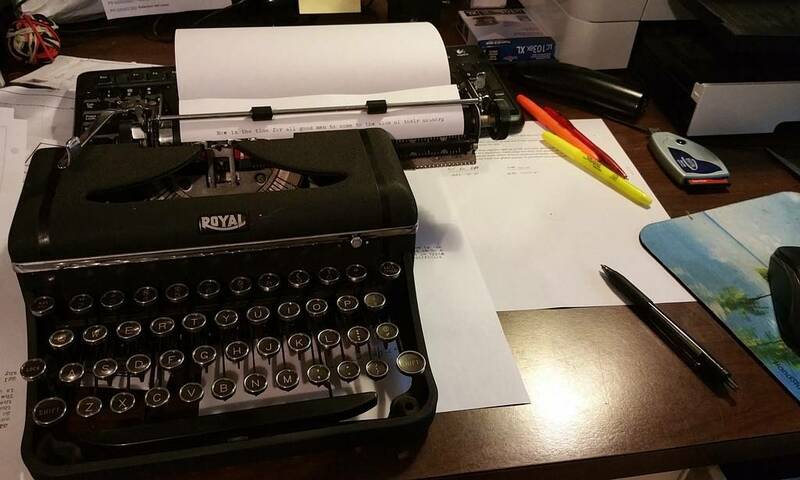 See the keyboard behind the typewriter? He probably has a port wired into the back of the machine. joecool wrote: That's pretty close to the model I used in HS typing class. Got up to 50 wpm. I have my Moms graduation type writer up on the shelf in the garage. It's very similar to what you have there. I haven't looked at it for a long time. Still in it's case. I used to type on it in High School. Phillip Gross wrote: New addition to my office. 1941 Royal Companion typewriter. Definitely a whole different world from the PC keyboard! You can't delete when you screw up and the keys are a whole lot harder to push unless you want the letter to be very light. It's fun to play with something genuine vs everything being electronic. We are in repair so it is pretty impromptu. Construction is different. It can all be scheduled. Phillip Gross wrote: I guess it's a hassle to get a road block permit? Seems like your office should be on top of stuff like that, unless the repairs are such that they can't know in advance where you'll have to be? I used a break down and fixed some wet paper cable today. Welded the wires honked it with a stick and then climbed up there and verified it with a hand coil and then cut open the lead sheath and poured in the dessicant and dried out the wet pulp cable. We only have one break down test set in springfield now. We used to have about 30 of them. Posted comment from Nov 20th..."This God-fearing Christian will go to the ends of the world to stop your evil (Islamic) ways." We don't have to go far. The FBI is tracking ISIS sympathizers in every state. And that doesn't count the unknowns, like the ones who killed many in CA yesterday. Law enforcement can't get there quick enough. "If you see something, say (shoot) something." I agree with a youtuber promoting #CarryEverywhere if its not a felony to do so. I've used manual typewriters too. Then Electric. Then word processor with floppy drive and monochrome screen in HS. Since we became homeowners again my hours have gone through the roof. good for house payment. Not so good for seeing my family. Make hay while the sun shines. It's been the struggle ever since the fall. The fact that we must toil with the land to provide for the family. I didn't know HFH had a mortgage payment. Philip and Chris, thats likely why Adam didn't do well with his firstborn son he didn't know how to balance work and home life. To Adam's credit he had no earthly father as example or other male counterparts to lighten his load. Why is that a stretch? He did get the benefit of his own childhood cause he had none. Till sons were born he had no help while Eve was busy popping out dozens of babies who knows how many she had in her lifetime. RRCmdrBennett wrote: Why is that a stretch? He did get the benefit of his own childhood cause he had none. Till sons were born he had no help while Eve was busy popping out dozens of babies who knows how many she had in her lifetime. Ok. I will poke at Dan this time. I am just going to poke at him with a stick and not say anything..just to see what happens. GRIN! I couldn't help myself. I had to poke him twice. Go ahead Phillip you poke him this time.